For a popular e-commerce summit, SapientNitro partnered with several presenting companies in creating a loyalty card program. Conference attendees could win prizes by visiting any or all of the companies at the summit, and by having their loyalty card “scanned” by an accompanied iPhone application at various partner booths. 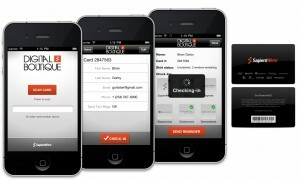 The iPhone application captures the barcode on the loyalty card and retrieves the cardholder’s profile via a collection of cloud-based web-services. Once verified, the app user can check-in the cardholder at the booth. The cardholder can also opt to have SMS reminders pushed to their phone to inform them of remaining booths they can check-in at.